Warm up your wardrobe with this sumptuous rose gold-plated bracelet watch from the desirable Editions collections by Sekonda. 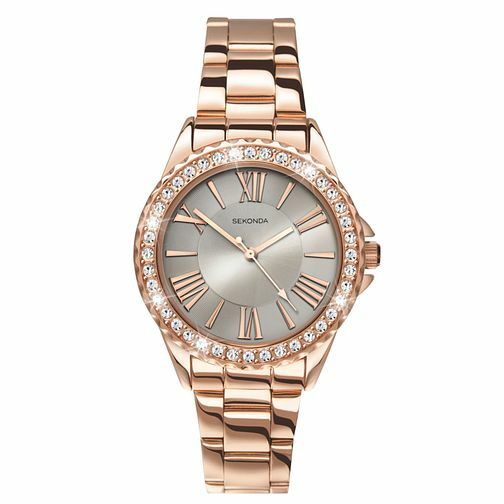 Featuring a chic grey dial with rose tone Roman markers and finished with a dazzling crystal bezel for a splash of glamour. Sekonda Editions Ladies' Rose Gold-Plated Bracelet Watch is rated 5.0 out of 5 by 8. Rated 5 out of 5 by Anonymous from Beautiful watch Ordered this watch because I liked the look of it online and I wasn't disappointed when it arrived. It's gorgeous and I haven't stopped wearing it since I got it.